When I attended the Rare Disease Day event hosted by Sanford Burnham Prebys Medical Discovery Institute, NGLY1.org, and CDG Care, I met a number of inspirational families. Families who have been struggling to find resources, help, and ultimately a cure for their child with a rare congenital disorder of glycosylation. These families are incredibly resourceful – because they have to be – at finding experts and coming up with out–of-the-box ideas. I met Ann and Steve Nguyen and their son, Emmett, during this visit. Emmett is a sweet boy who was born with a mutation in the PIGA gene (follow their journey here and here). Patients with mutations in PIGA, like Emmett, have a devastating metabolic disorder that involves infantile spasms and intractable epilepsy. This, of course, impacts all aspects of development and everyday functions. This was the Nguyen’s first CDG meeting and first rare disease day event, but they showed up with a poster for the scientific poster session. With the help of a friend, the poster presented a multipoint plan on potential therapeutic interventions that might work for Emmett. I looked it over and it seemed quite reasonable and could be successful. After chatting with them, I did a simple Pubmed search on PIGA biology. What was missing, however, was an animal model and some basic understanding of the physiological consequences of losing PIGA function. I continued to chat with the family throughout the meeting and it quickly became clear to me that we could use some of our approaches studying Drosophila models of other rare diseases to work out the effects of PIGA mutations. What is PIGA? Phosphatidylinositol N-acetylglucosaminyltransferase subunit A (PIGA) protein is a subunit of a larger complex involved in the synthesis of N-acetylglucosaminyl phosphatidylinositol (GlcNAc-PI). 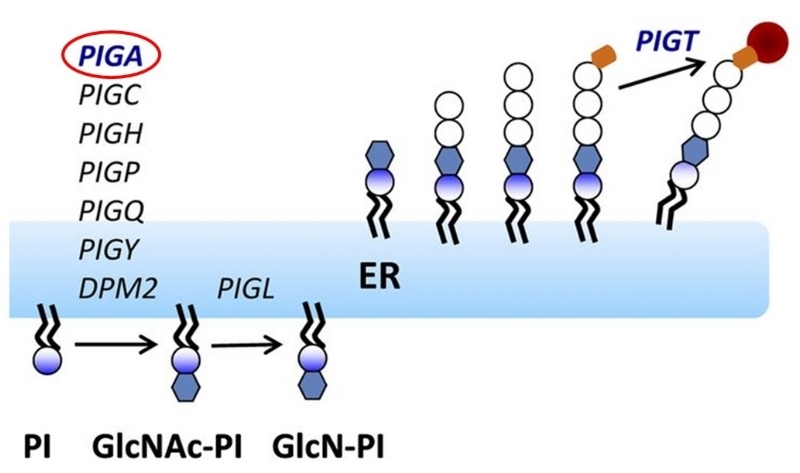 The production of GlcNAc-PI is the first step in the biosynthetic pathway generating the GPI anchor. The GPI anchor is a glycolipid that serves to anchor proteins on the cell surface. PIGA functions on the cytoplasmic side of the endoplasmic reticulum (ER) membrane. While this biochemical function is well understood, there is little known about the physiological consequences of loss of PIGA function (except we know the null mouse is early embryonic lethal). This is where we can step in and try to work out what might be happening in a Drosophila model. modified from Brodsky, Blood 2014 124:2804-2811. 3) Study consequences of loss of PIGA function in the nervous system (seizures are associated with PIGA mutations). 5) “Rescue” the null fly with transgenes expressing mutant PIGA proteins from the patients. There’s a lot of interesting biology here, but more importantly, we can make a lot of progress on this understudied rare disease using the powerful Drosophila model. We hope to stay in touch with the Nguyen family and others impacted by PIGA mutations and test some of their ideas and experiences in our lab. All material on this website is copyright to Clement Chow, unless otherwise noted.